Wasn’t it just a week ago that I got into my beehives to check on their spring progress? Did I really say that I saw no signs of swarming? Did I really say that? Ha! The joke is on me, for sure! Just goes to show how little I actually know about the nature of bees after fifteen years of keeping them. Today, my bees issued a giant swirling mass of buzzing bee love. The swarm: a beehive’s way of reproducing itself. Really, swarming is a good thing. Most of the time it shows that a hive is healthy and strong enough to split apart. To the beekeeper, though, it can sometimes be so humbling to watch half of your bees fly off into the wild blue yonder. We have the added bonus of living in a fairly deep hollow, surrounded by fairly large trees. 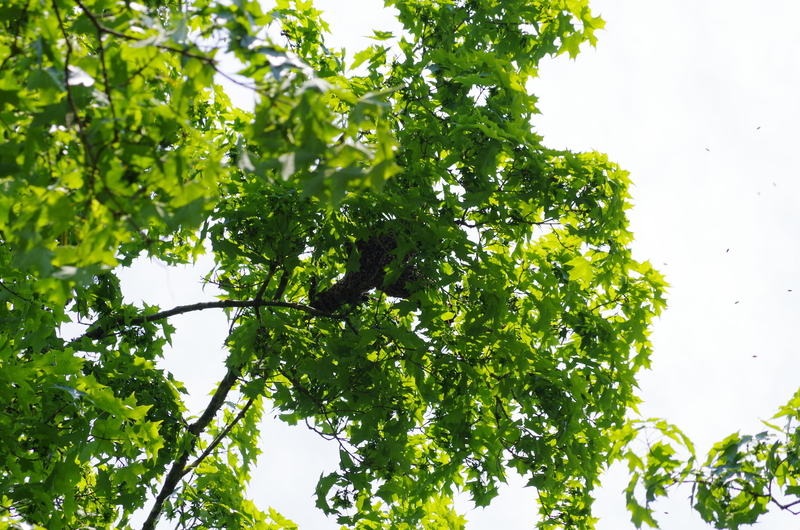 It seems that any swarm that has ever come from the hives I keep down by our house tends to gather at least fifty feet up in a tree (fyi… this is not at all what most beekeeping books say will happen when a hive swarms. ahem. ), making them very much out of reach for capture. So even though I said I saw no signs of swarming in my hives, my bees had other plans apparently. This entry was posted in cher's posts, right now and tagged beehive, beekeeping, bees, homesteading, honeybees, swarming by cher. Bookmark the permalink. Oh, no!!!! Soooo many beekeepers would love to get their hands on a free swarm. The fact that they were just “exterminated” makes my heart ache. Honeybees are too precious for that fate. I work for a large company in a large city (didn’t plan it this way…long and sad story) and they are absolutely scared to death of liability….to 99% of the folks in the office, all bees are ‘killer bees’ and killer bees spend all their time just waiting to kill someone…..sad…. Lemony smell is what may draw a swarm. A few drops of lemon-scented essential oil is easiest and best. Lacking that, rub the inside of the bait hive with lemongrass or lemon balm or fresh lemon zest. We have even heard of some beeks using lemon-scented furniture polish. Using the formerly successful trap location is a good idea. Thanks for this tidbit! I’m swimming in lemon balm so I’ll go and rub some in the bait hive right now. 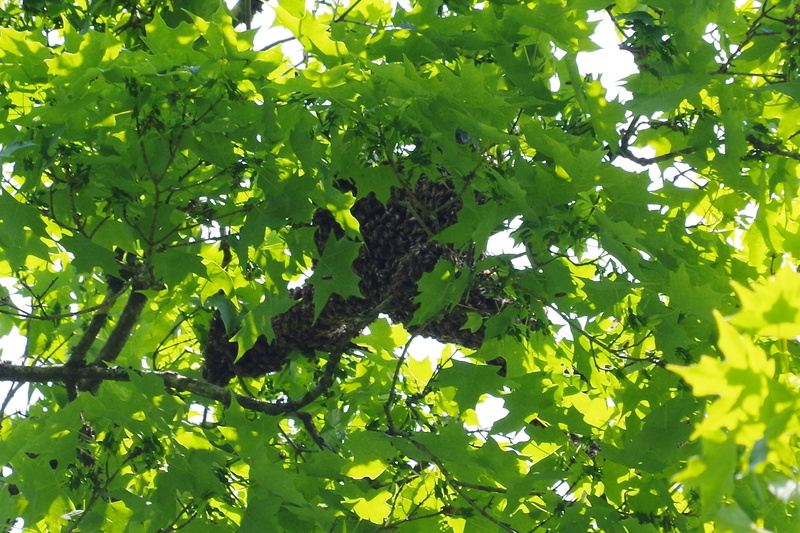 The swarm is still up in our maple tree and I’m still hoping! Just to pursue another avenue, how accurate was that fifty foot high estimate? Are they really out of reach of an improvised bucket/bag on a pole? Scouts probably had candidate locations already picked out. Better luck next time. You could leave your bait hive in place and refresh the lemony scent periodically. Swarm season is not over yet. 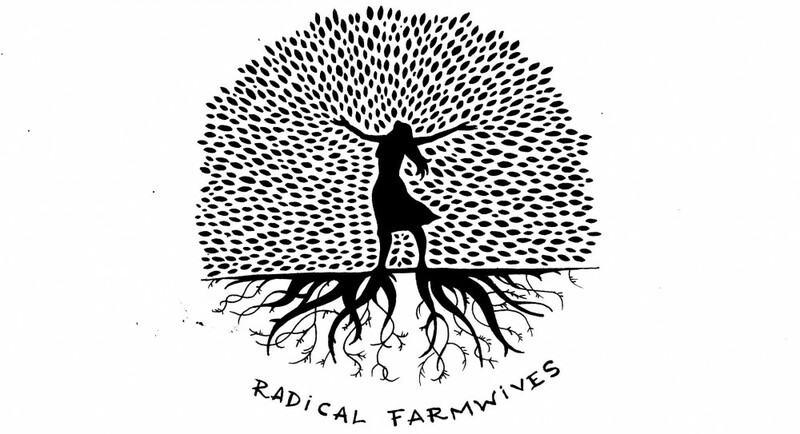 I, too, hope they land in your loving, honey-smelling, lemon balm-smellin hands…so to speak. And exterminating honeybees should be out-lawed. That’s just criminal given all the trouble we’ve placed them in. Good luck Cher. Thank you, and I totally agree with your sentiments. 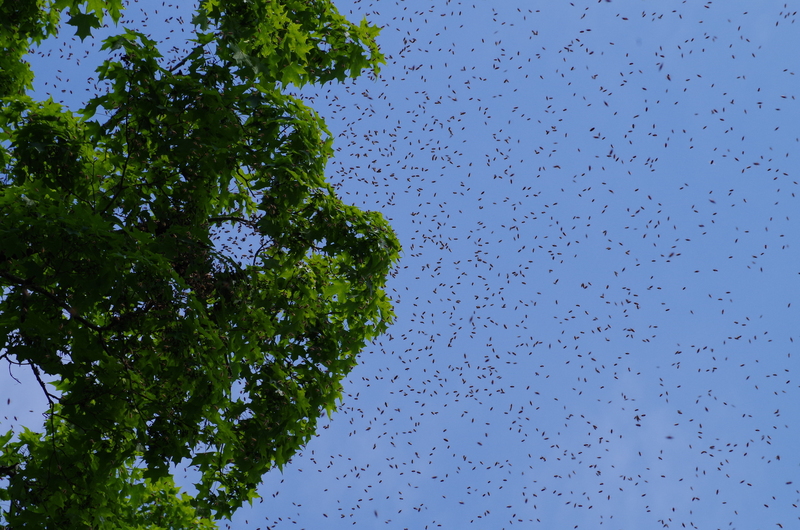 I didn’t catch this swarm, though… maybe next time. They are such mysterious creatures. Here in Denver we are lucky to have swarm lists. 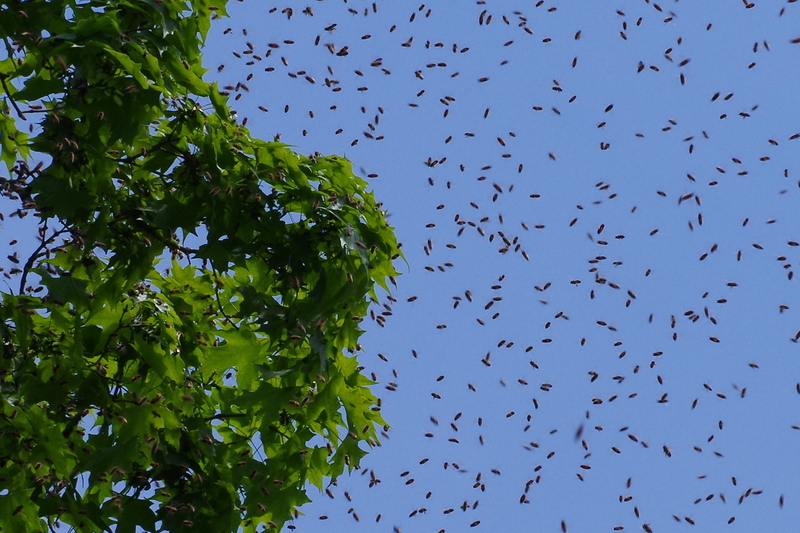 So if someone calls the city to have a swarm exterminated, the city will call the Bee Society and have them go out and collect the swarm to give it to the next person on the swarm list. There is hope for the honey bee! How lovely it would be if yours decided to stay home after all. Cool. I will certainly check it out. And, yes, fascinating!